Looking at the 2013 WAR values for players on the 2014 Opening Day rosters for the clubs of the American League West, the Oakland Athletics would have to be favored. But early injuries are among the reasons the Los Angeles Angels might have a chance. 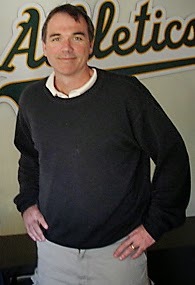 Oakland Athletics General Manager Billy Beane and his staff have accumulated more high WAR value players than any other club in the game (Brett Farmiloe/Creative Commons Attribution 2.0 Generic license). Following is a team-by-team look at each team in the American League West entering the 2014 season, listing each team's players who finished in the top 240 among position players and the top 240 pitchers by 2013 WAR. It is a new season and the slate is wiped clean. In fact, the injuries of spring training already have forced equivocations and commentaries to demonstrate where these lists might steer us wrong. But they are a starting point. We list each team in the division, giving each club's "top half" position players by 2013 WAR, its "second-level" position players, its top-level pitchers and second-level pitchers. For the top-half position players, we give the player's position and where he ranked at the position across big league baseball in 2013 WAR, then the actual WAR value for the player. For every other category, we give the player's overall 2013 WAR ranking, understanding that pitchers and position players are ranked separately. More about all of this, including some important clarifications, can be found here. Bear in mind, though, that the 2013 WAR totals for each club only include these top players, and every club will have players with little, no or negative WAR value that actually would drag down its totals. By the following readings, alone, the Oakland Athletics would be the favorites to win the AL West. However, the world is changing all the time. Top-half position players — 1B: Brandon Moss, 15, 2.2. 2B: Eric Sogard, 15, 2.1. SS: Jed Lowrie, 15, 2.3. 3B: Josh Donaldson, 1, 8.0. RF: Josh Reddick, 11, 2.6. CF: Coco Crisp, 8, 4.3. LF: Craig Gentry, 6, 3.6. Total: seven players, 25.3 WAR. Second-level players — Nick Punto, IF, 126, 2.2. Derek Norris, C,149. 1.8. Yoenis Cespedes, OF, 155, 1.7. John Jaso, C, 197, 1.1. Stephen Vogt, C, 0.7. Total: Five players, 7.5 WAR. Top-level pitchers — A.J. Griffin, 73, 2.3. Jarrod Parker, 99, 1.9. Total: two pitchers, 4.2 WAR. Second-level pitchers — Jim Johnson, 123, 1.5. Ryan Cook, 135, 1.4. Sonny Gray, 146, 1.4. Dan Otero, 148, 1.3. Sean Doolittle, 156, 1.2. Dan Straily, 165, 1.2. Scott Kazmir, 173, 1.1. Luke Gregerson, 214, 0.7. Tommy Milone, 231, 0.6. Total: Nine pitchers, 10.4 WAR. Take a look at those top-level pitchers. Neither is with the club as it opens the season. Parker is gone for the year with Tommy John surgery, and Griffin is down right now with elbow problems of his own. It's also not sufficiently appreciated that the A's are without Bartolo Colon, who tossed a pretty 5.0 WAR for them in 2013 before signing as a free agent with the New York Mets. Thus, the A's are without their top three starting pitchers from 2013, and two of them aren't coming back this year. However, the A's have a whopping nine pitchers on that second-level list, and some of them, like Gray, Straily and, maybe, Kazmir, figure to be much more productive in 2014. But pitching depth, which the A's have, is not the same as pitching dominance, which they lack. On the position side, this club is solid, though not spectacular. The A's have a top-half player at every position except catcher. Of course, catching is a little different, because some clubs (like the A's) will split that position and, therefore, not place a catcher in the top 15. However, Norris, Jaso and Vogt totaled 3.6 WAR in 2013, which is rock solid. The A's should be the division favorites going into 2014, but their pitching is wobbly at the top levels, and that's where they appear to be the most vulnerable. Their biggest strength is a deep bullpen, which they will need. Top-half position players — SS: Elvis Andrus, 4, 4.3. 3B: Adrian Beltre, 6, 5.5. CF: Leonys Martin, 12, 3.4. LF: Shin-Soo Choo, 3, 4.2. Total: Four players, 17.4 WAR. Second-level players — Alex Rios, OF, 135, 2.1. Prince Fielder, 1B, 158, 1.7. Geovany Soto, C, 172, 1.4. Total: three players, 5.2 WAR. Top-level pitchers — Yu Darvish, 10, 5.8. Derek Holland, 36, 3.3. Neal Cotts, 59, 2.6. Tanner Scheppers, 74, 2.3. Alexi Ogando, 77, 2.2. Martin Perez, 114, 1.6. Total: six pitchers, 17.8 WAR. Second-level pitchers — Robbie Ross, 156, 1.2. Jason Frasor, 168, 1.2. Total: two pitchers, 2.4 WAR. The Rangers are starting the season without their front two starting pitchers from 2013. Darvish is down for a while with neck stiffness, and Holland is out until at least the All-Star break with a microfracture in one knee. And the Rangers can't offset these losses with the kind of pitching depth that Oakland has. Additionally, the Rangers have disabled Soto and a couple good guys not on this list, lefty Matt Harrison and infielder Jurickson Profar. The Rangers also traded second baseman Ian Kinsler and his 2013 WAR of 5.0 for Fielder and his 1.7 WAR in 2013. If Fielder can bounce back to All-Star level productivity, he will make up the difference for the Rangers losing Kinsler, but that wouldn't be enough to make up for losing Holland. We'll see how the Rangers patch it together. The suspicion here is that this club has seen better days. However, they do get a little reprieve in that the main division competition, the Oakland Athletics, are dealing with severe depletions among their top-level pitchers. Top-half position players — 2B: Howie Kendrick, 9, 3.4. CF: Mike Trout, 1, 9.2. Total: two players, 12.6 WAR. Second-level players — Chris Iannetta, C, 145, 1.9. Erick Aybar, SS, 155, 1.7. Josh Hamilton, OF, 165, 1.5. Albert Pujols, 1B, 169, 1.5. Hank Conger, C, 199, 1.1. J.B. Shuck, OF, 217, 0.9. Total: six players, 8.6 WAR. Top-level pitchers — Jered Weaver, 29, 3.7. C.J. Wilson, 35, 3.4. Hector Santiago, 55, 2.8. Joe Smith, 103, 1.8. Total: four pitchers, 11.7 WAR. Second-level pitchers — Dane De La Rosa, 150, 1.3. Garrett Richards, 201, 0.9. Michael Kohn, 231, 0.6. Ernesto Frieri, 239, 0.6. Total: four pitchers, 3.4 WAR. No club in this division has more legitimate room for improvement than the Angels. First, this club has famously under-performing stars from 2013, like Hamilton and Pujols, both of whom look good this spring. For that matter, Aybar should be much better than 1.7 WAR. On the pitching side, Weaver is a fascinating case who just keeps going as his velocity declines, and Wilson is about as good of a No. 2 starter as you can find. And take a look at Santiago, ranked 55th among all pitchers in 2013 WAR. If we go through the starting pitchers and say, "OK, the top 30 starters by WAR are No. 1 starters (one for each club), and the next 30 are No. 2 starters ... ," then Santiago shapes up as a legitimate No. 2. He still needs to establish that kind of durability, but the potential is there. Unlike the three clubs listed above, the Angels broke camp without serious injuries to their pitching staff. This club has started badly for the last two seasons. But, in view of problems facing Oakland, Texas and Seattle concerning the disabled list, the conditions are in place for the Angels to go off on a good start. If the Angels can work up an early lather, they can be the club many thought they would be for the last two years. Top-half position players — 2B: Robinson Cano, 1, 7.6; Nick Franklin, 13, 2.3. 3B: Kyle Seager, 8, 3.9. Total: three players, 13.8 WAR. Second-level players — Brad Miller, SS, 141, 2.0. Michael Saunders, OF, 180, 1.3. Dustin Ackley, OF, 201, 1.1. Justin Smoak, 1B, 203, 1.1. Total: four players, 5.5 WAR. Top-level pitchers — Hisashi Iwakuma, 3, 7.0. Felix Hernandez, 13, 5.2. Yoervis Medina, 98, 1.9. Total: four pitchers, 15.9 WAR. Second-level pitchers — James Paxton, 173, 1.1. Stephen Pryor, 237, 0.6. Total: two pitchers, 1.7 WAR. It remains mysterious why the Mariners sprung $240 million over 10 years for Cano when they already might have their second baseman of the next 10 years in Franklin. The Mariners ended up putting Frankin in a shortstop competition with Nick Miller, who ran a nice 2.0 WAR in 76 games last season. Franklin lost, so his 2.3 WAR begins the season at Tacoma. Iwakuma is down for the first month of the season after a spring training injury, another big blow. The Mariners have some interesting young pitchers, including Paxton. In total, this is looking like a badly built team with only one decent right-handed hitter, Corey Hart, who didn't play at all last season. The Mariners are a fourth-place team paying Cano $24 million per year, and they would be a fourth-place team without that contract. Top-half position players — C: Jason Castro, 3, 4.5. Totals: one player, 4.5 WAR. Second-level players — Matt Dominguez, 3B, 124, 2.2. Dexter Fowler, CF, 133, 2.1. Jose Altuve, 2B, 206, 1.1. Totals: three players, 5.4 WAR. Top-level pitchers — Jarred Cosart, 62, 2.6. Jesse Crain, 69, 2.4. Brett Oberholzer, 81, 2.1. Scott Feldman, 118, 1.6. Chad Qualls, 107, 1.8. Totals: Five pitchers, 10.5 WAR. Second-level pitchers — Kevin Chapman, 204, 0.8. Totals: one pitcher, 0.8 WAR. Three straight years of not even winning 60 games make the Astros the least competent operation of the last 50 years and, unlike the New York Mets of the early 1960s, they're well past being an expansion team. The Astros have added some meat to their pitching staff with Crain, Feldman and Qualls. But they're still not close to fielding a competitive Major League club.